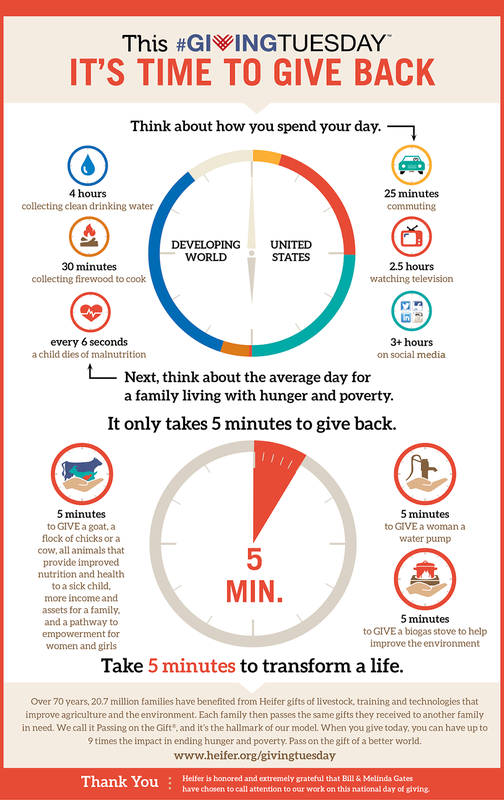 Give to Heifer on Giving Tuesday!! Giving Tuesday, December 1, is just around the corner. When you’re rounding up sales for everyone on your shopping list, please make one more purchase that means the world to a family far away. Our lives are busy, especially this time of year. Can't find the perfect gift for friends and family that has everything? Looking for a meaning and inspirational gift? Don't think you can make a difference with 5 minutes? YES, you can do it all! Get them a gift of Heifer!! Heifer International has been working to change lives, reduce poverty and hunger, and build community for over 70 years. Check our approach to this work. It's much more than handing over livestock and wishing them well. Heifer staff work with small farmers, letting them decide the kind of project they want, work with them before, during and after receiving livestock to make sure they have every chance of success. This approach not only reduce poverty and hunger, but more importantly builds communities and connections that leads to sustainable success. Want to know more? How can a cow help people out of poverty? Well, we have just the video for you! Thank you for donating to Heifer International on Giving Tuesday!! Heifer Sacramento volunteer John Brewer presented a framed certificate of appreciation to Ms. Julie Bair and her fifth grade class at Seven Hills Middle School in Nevada City, California this November. Ms. Bair’s guided her fifth grade students in a service learning project, Scarecrows for Heifer. The project sparked creativity among her students and engaged their families and the community to raise funds to benefit resource poor farmers served by Heifer International. Ms. Bair has worked with students in the Nevada City schools on scarecrow projects over many years to raise funds to support Heifer International’s mission of helping families. Hats off to Ms. Bair from Heifer International for her dedication to both Heifer and developing the next generation of donors! This year, Ms. Bair's fifth grade students each gathered materials and designed handcrafted scarecrows, which were then sold at Prospector’s Nursery in Nevada City for $40 each. This year’s Scarecrows for Heifers received generous donations from B&C True Value (lumber), Pearson’s Feed (hay), and Ridge Feed and Supply (burlap sacks) in Grass Valley. All of the proceeds went to the class project and the students decided how to use the proceeds to purchase livestock that would be donated. Ms. Bair's students and their creations for Scarecrows for Heifer. John enjoyed interacting with the students, hearing about what they had learned about Heifer, and offering them a bit more information on Heifer's mission. He told them more about Heifer’s Cornerstones and answering their very thoughtful questions. John plans to return to Ms. Bair’s class early next fall during the early phase of their next scarecrow project and prepare an article on their efforts for Heifer International’s The Ark magazine. 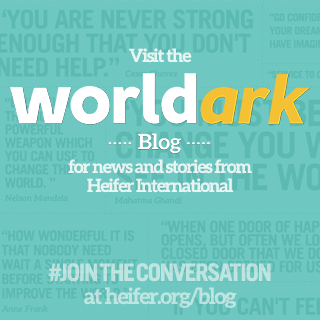 Read more about Heifer's Cornerstones or Values Based Development. THANK YOU for a fantastic Heifer Tails! 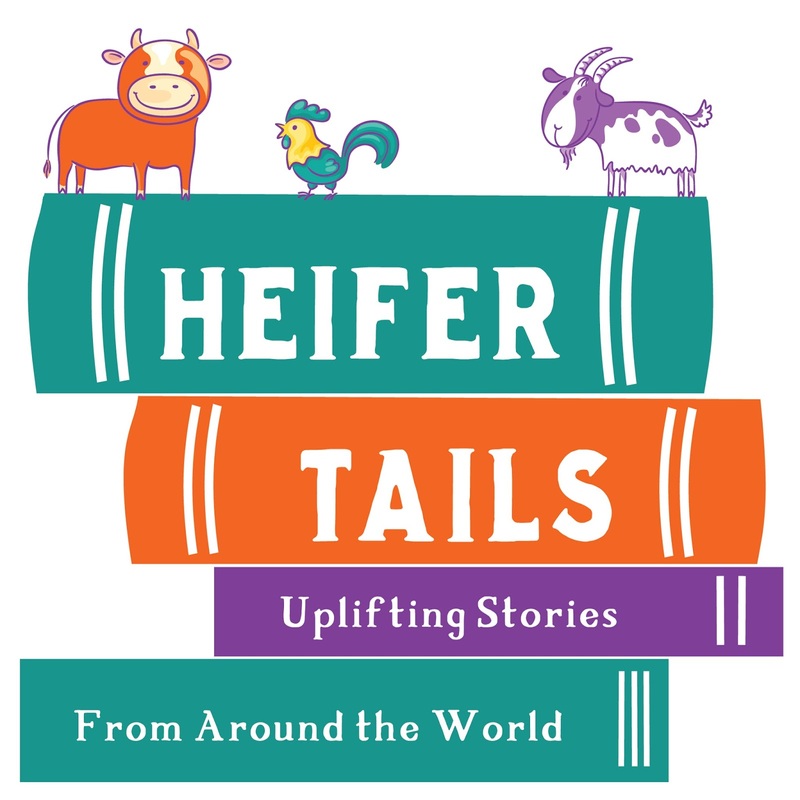 On September 20th, Sacramento Heifer Volunteers hosted Heifer Tails, a storytelling event at Westminster Presbyterian Church. As mentioned in previous posts on this blog, the goal of the event was to raise funds to support Heifer communities in Nepal affected by earthquakes earlier this year. Our volunteer group was energized by the enthusiastic involvement of gifted tale spinners from the local storytelling community, headed up by Mary McGrath, and the participation of world music talent Bob Wren. Westminster Presbyterian Church generously provided a perfect setting. And the event was a sell out! We moved furniture and added chairs to accommodate the standing room crowd eager to listen to timeless folktales from around the world. Check out the video of the event. This wonderful event raised over $8,800 in donations and ticket sales and was matched by a $10,000 donation from a Bay area foundation, making a grand total of over $18,000 for earthquake recovery efforts by Heifer communities in Nepal. Needless to say our volunteer group is over the moon with the results! During the spring 2015 earthquakes, nearly 23,000 Nepali families in 97 Village Development Committees (VDCs) and across 13 districts lost their homes and livelihoods. Members of Heifer's Self-Help Groups and Cooperatives played a key role in immediate relief support before government or other assistance arrived, ensuring distributions went smoothly and each family received some support. After those immediate needs were met by Heifer and other relief organizations working in the country, and because it was clear the rebuilding and recovery would require a long-term approach, Heifer established a revolving fund for communities that saw the worst damage. Participants advocated for this approach because it would allow the communities to make joint decisions about how to best distribute and utilize funds. All monies will stay in the communities to provide continuous support in the future. Reports from Nepal are showing our approach is having a large impact on helping farmers recover. 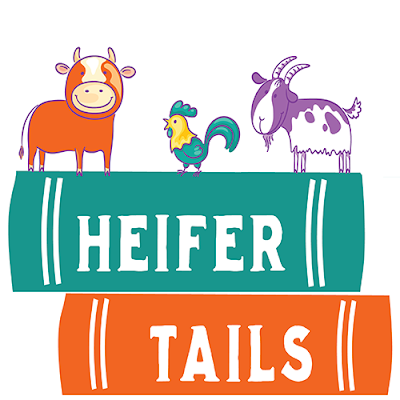 The Sacramento Heifer Volunteer group wishes to express deep gratitude to the many attendees, talented local storytellers and musicians, and to Westminster Presbyterian Church for coming together to make Heifer Tails a success. In this post, we want to tell you more about our line up of storytellers and announce that Bob Wren will add his musical talents to our stories! Mary McGrath brings 30 years of storytelling performance to her audiences. She most recently performed with the Sacramento Symphony, at the Crocker Art Museum, and at festivals in Canada, Ireland, and Scandinavia. She has taught “The Art of Storytelling” at the Sacramento City College and produces programs with “Straight Talk Storytellers at Belle Coolidge library. Ray Tatar has been the artistic director of the California Stage Theatre for 15 years. Prior to that he was the theatre and literature grants administrator for the California Arts Council. He has hosts Live Wire community programs on Access Sacramento for the past 8 years. Diana Salgado Zuñiga developed her storytelling style during her 32 years working in the Heads Start School Program. She is currently a writer at the Hart Senior Center’s History Writing Group. Nancy Griffith is a retired teacher that has always enjoyed the art of storytelling. Bob Wren has been playing the violin for 55 years, but he has also developed a large world music repertoire along the way. He led the Sacramento City College World Music Ensemble for 12 years and continues to teach music appreciation to students there. Bob's repertoire is as diverse as his range in playing musical instruments. Take a look at this video. We are very excited to have Bob on board for this event. His musical talents will make the stories extra special. Big Thank Yous in advance to Mary, Ray, Diana, Nancy and Bob for generously donating their time and talent for this event in support of the work of Heifer International!! As a result of the 7.8 magnitude earthquake last week, Heifer project families in Nepal have suffered significant loss of property, including their homes and livestock that donor generosity has provided them. The full extent of damage is still being tabulated — roads are clogged with debris and power and communication lines are still down. Several days ago, Heifer staff in Nepal were able to reach some of the affected areas. At least 6,300 project participant homes across 12 districts had collapsed while another 1,900 families have sustained major damage. Heifer families also lost at least 1,500 animals. These numbers are expected rise. For the most recent information regarding our Nepal projects, please visit the Heifer online blog here, which includes a map of the earthquake affected regions. It will be updated as more information is received from Heifer staff in Nepal. 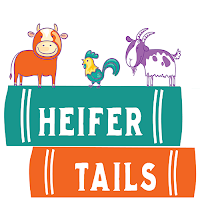 Heifer International has identified an urgent funding opportunity to reach project families to meet their immediate needs, like food, tarps, mats and other shelter supplies. Donate to the Nepal Disaster Rehabilitation Fund now. Your response right now will determine how quickly our Heifer families in Nepal will be able to recover from this devastating earthquake. Thank you for your support during this time of need. Please keep our Nepali project families in your thoughts. March 8 is International Women’s Day. Heifer International celebrates women the world over who work to feed their families, become small business owners, and educate their children among many other tasks they perform for their families. They grow 60-80 percent of the food in developing countries yet own less than 1 percent of the Earth's land. Despite making up half the world's population, women have been marginalized in most societies throughout human history. Heifer International invests in women small holder farmers to relieve malnutrition and help create business owners that generate a sustainable income for their families. Women also spent much time collecting fuel to cook for their families. This effort to chop, collect and carry biomass for miles can take hours, cutting into the time they need for other chores like fetching water, caring for children, working the fields and herding animals. Cooking with open fires is also a huge health risk. Smoke inhalation contributes to millions of deaths every year. World Ark contributor, Erik Hoffner interviews author Gautam Yadama on his book Fires, Fuel & the Fate of 3 Billion: The State of the Energy Impoverished, a new book that takes a close look at this global problem. Learn more about how you can help Heifer International's work in empowering women farmers to help feed the world.